Biotech Muscle Mass is a unique protein-carbohydrate cocktail with addition of creatine monohydrate and glutamine peptides. 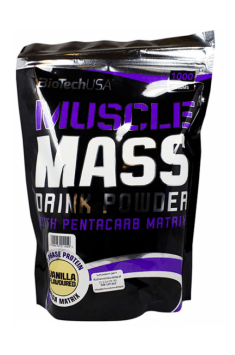 This product contains macronutrients in the right proportion and is a combination of both gainer andimproved creatine supplement. One serving provides 2100mg of micronized creatine monohydrate and 275 kcal of energy. The energy is provided by carefully selected nutrients intelligently responding to the body's needs. This product is an ideal solution for slim people who want to gain mass quickly. It provides simultaneous supply of proteins, carbohydrates and fats of various origins. To satisfy the customers tastes this product comes in three popular flavours. Micronized creatine monohydrate, creatine combined with one water molecule and subjected to micronization process. This process consists in a significant reduction of the molecule size to the size of micrometre in order to give it bioavailability. The reduced creatine monohydrate molecules have larger contact area to water molecules what results in increased water absorption andeasier dissolving in comparison to ordinary, uncrushed particles. Creatine monohydrate is a form of creatine that is very popular. It is the purest form of creatine on the market. In addition, it is fast acting, so after a short time the effects of its use are visible. Creatine occurs naturally mainly in our muscles. The demand for it increases significantly in physically active people. It is a phosphorylated compound that binds to phosphate residue and forms phosphocreatine. When the muscle cell needs more energy (i.e. during intense workout), the phosphocreatine supply serves as a storage of phosphate residues that are necessary for ATP synthesis. As a result, additional energy in form of high-energy bonds in ATP molecule allows you to perform even heavier workouts and supports faster muscle mass gain. In addition, creatine exhibits anabolic ability, reduces muscle fatigue and facilitates their regeneration. The increased amount of energy in muscle cells serves as fuel for all other metabolic changes, not only those associated with muscle fibers contraction. The PentaCarb Matrix blend supports protein synthesis and glycogen resynthesize in the muscles increasing their strength and endurance. Protein Matrix is ​​a source of the highest quality proteins in various forms. This blend contains wholesome proteins with different absorption rates: hydrolysate, concentrate and whey protein isolate as well as casein and egg proteins. Whey proteins increase the level of amino acids in the bloodrelatively quickly, so shortly after consumption they are used for protein synthesis. Casein is digested more slowly and releases the amino acids for longer period of time, so they are present in blood for longerand have long-term effect. The selected composition of proteins makes this blend ideal for use immediately before or after training, and at any time on non-workout days. It provides the body with 12g of full-value protein (per serving), which will efficiently and for a long time supply the amino acids to growing cells. In one serving this product provides 2.3 g of dietary fibre and 2.6 g of fat that helps to exploit fat-soluble vitamins. Glutamine peptides are naturally derived from wheat seeds. It is L-glutamine combined with other amino acids by peptide bonds. The bound glutamine in the form of peptide is much more stable, gradually released into the blood and easier assimilated by our body. L-glutamine is an amino acid inhibiting muscle catabolism in situations of increased energy demand. It also intensifies anabolic processes and participates in nitrogen compounds metabolism, for example urea or nitrogen bases. It can be an additional source of energy, because as a result of enzymatic reactions it is transformed into compounds that are substrates of gluconeogenesis or the Krebs cycle. Biotech Muscle Mass is a unique dietary supplement that fulfils the function of both, the gainer and creatine supplement. It provides valuable macronutrients and substances that build muscle mass: creatine monohydrate and glutamine peptides. This product is perfect for people who have problems with covering their caloric needs and for slim people who want to effectively increase their body mass. CHOCOLATE FLAVOUR: PentaCarb Matrix 65% (sucrose, dextrose,fructose, maltodextrin, corn starch), fat-reduced cocoa powder,Protein Matrix 7% [whey protein concentrate, hydrolysedprotein,calciumcaseinate (contains milk), whey protein isolate, eggwhite powder], glutamine peptide (contains wheat), thickener (cellulosegum), emulsifier: lecithins (soy), flavourings, salt. VANILLA FLAVOUR: PentaCarb Matrix 73% (sucrose, dextrose,fructose, maltodextrin, corn starch), Protein Matrix 7% [wheyprotein concentrate, hydrolysed protein, calcium caseinate (containsmilk), whey protein isolate, egg white powder], glutaminepeptide (contains wheat), thickener (cellulose gum), emulsifier:lecithins (soy), flavourings,salt, colour (tartrazine). STRAWBERRY FLAVOUR: PentaCarb Matrix 72% (sucrose, dextrose,fructose, maltodextrin, corn starch), Protein Matrix 7% [whey proteinconcentrate, hydrolysed protein, calcium caseinate (contains milk),whey protein isolate, egg white powder], glutamine peptide (containswheat), thickener (cellulose gum), emulsifier: lecithins (soy), flavourings, acid (citric acid),salt, colour (Allura Red AC).